(Mens L) Snuggly Ugly Xmas Sweater! Decadent Sparkly Snowflakes in Gold & Silver! Home > Ugly Christmas Sweaters > Ugly Christmas Sweaters (pullovers) > (Mens L) Snuggly Ugly Xmas Sweater! Decadent Sparkly Snowflakes in Gold & Silver! Ugly Christmas sweater pullover! 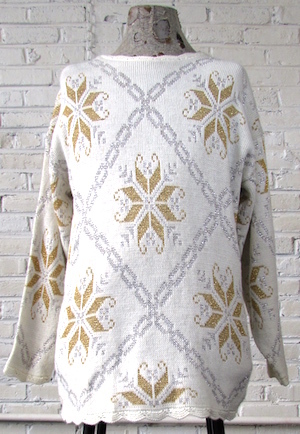 Super soft and cuddly white knit sweater with a fancy allover design of sparkly gold and silver colored snowflakes! Snowflakes are surrounded by a diamond shape created by a chain like design in a sparkly silver. Collar, cuffs and the bottom of the sweater are scalloped. Tagged Nutcracker. Acrylic/Lurex blend. Chest: 42" best for a mens LARGE.